Cufflinks with electric guitar. 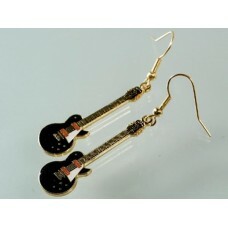 They are plated in rhodium, the finish is polished.DIMENSIONS: cm 3 ..
Earrings with Gibson Les Paul Custom electric guitar. Black, red and white enamel.Gold-colored finis.. 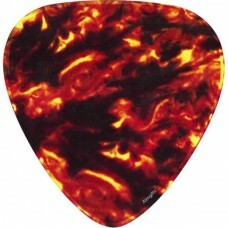 Mouse pad, plectrum (fiery) for guitar. It is just a color photograph. The back is made of non-slip .. 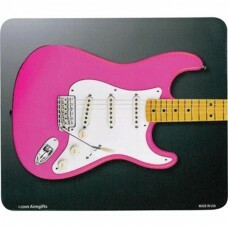 Mouse pad with pink Fender Stratocaster guitar. The back is in non-slip rubber. Very robust and prof.. Mouse pad, with Gibson Les Paul electric guitar. The back is in non-slip rubber. Very robust and pro.. Skinny tie, in black satin. 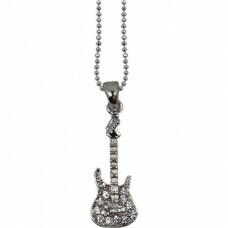 It has a design with repeated electric guitars in white silver. 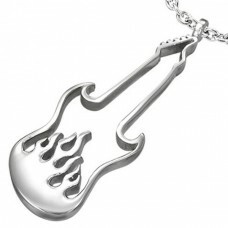 Handmade..
Steel necklace with pendant, also in steel, depicting a flaming guitar. The guitar is made with just..
Necklace with guitar and flames. Necklace with pendant, both in steel. 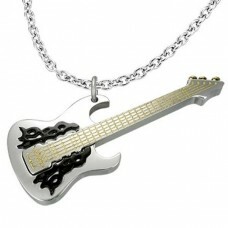 The pendant represents a guitar with flames, in anodized steel..
Papillon or bow tie for music fans. It is black, polyester, and is decorated with electric guitars o..